Hello there! Happy Sunday to all. I hope everyone is having a fabulous weekend. Mine has been busy, but a lot of fun. 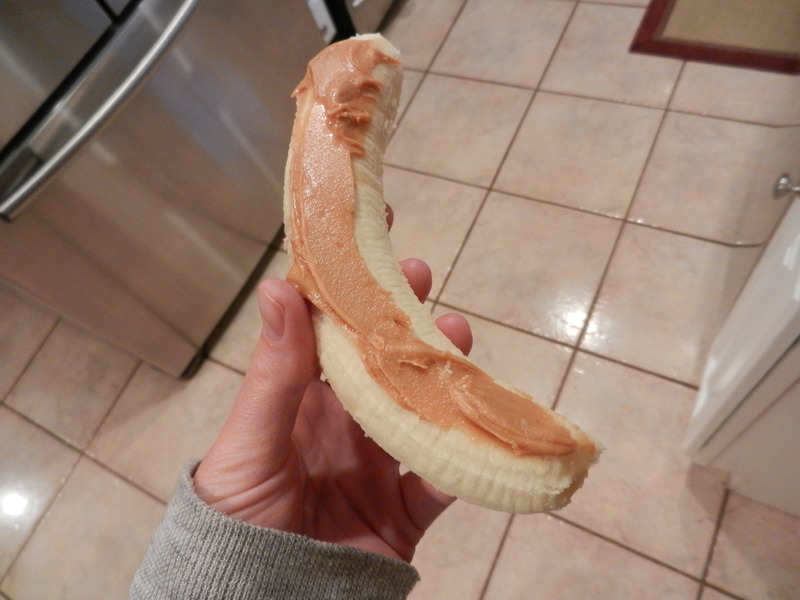 It was Warrior Dash morning which meant I was going to have my typical pre-race meal: perfectly ripe banana with a light smear of Smart Balance peanut butter. 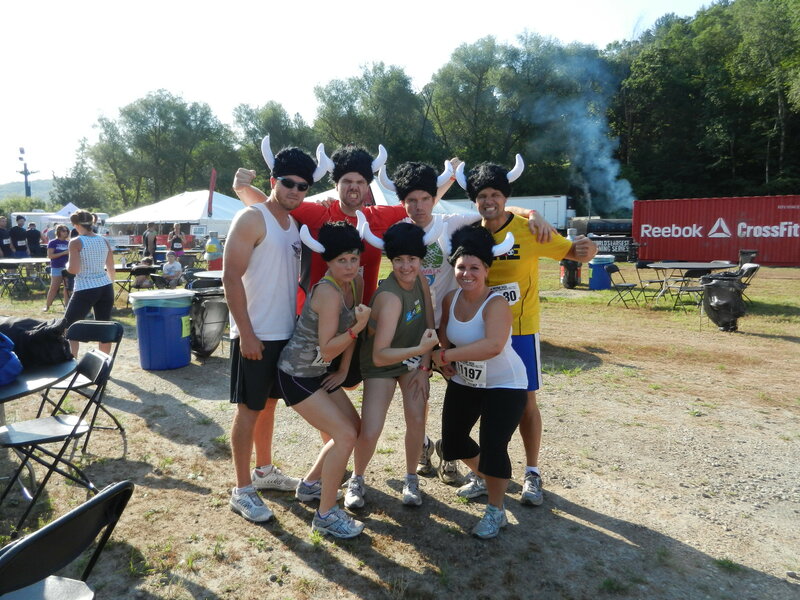 I gathered the first set of troops for a “I-just-got-out-of-bed-but-let’s-do-this” pre-race photo. We made our way to Afton Alps and picked up some of our friends on the way. Parking cost $20 so we figured we would pack everyone in to one vehicle to cut the cost, and hey, we were going green too. The parking scene was an obstacle in itself–driving through farms, weaving around cones, riding over some seriously bumpy terrain; it was actually hysterical. Once we parked, we took a shuttle bus over to the race. 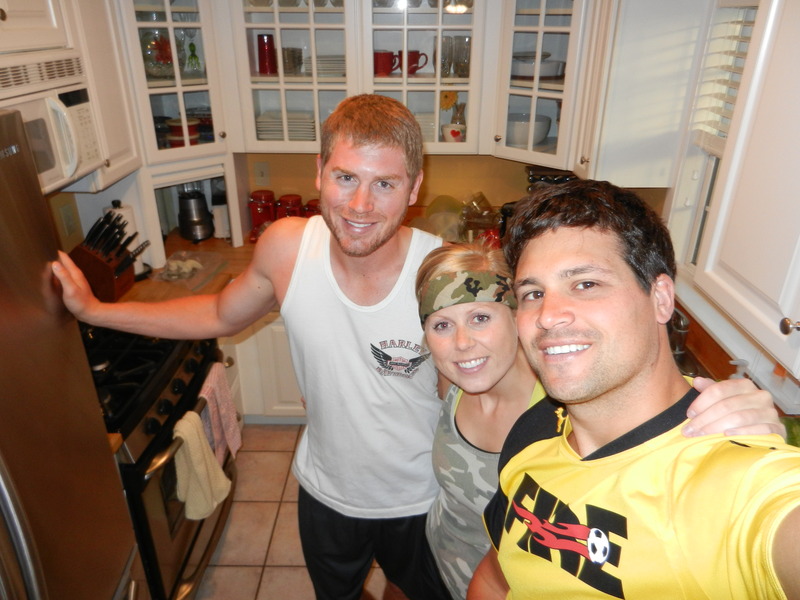 Here is my brother Kevi, and our friends Matt and Steph. 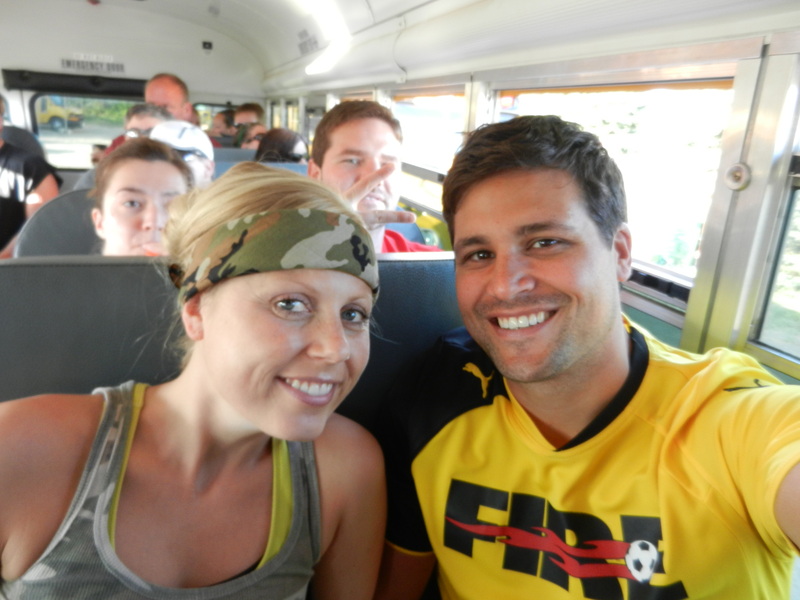 Dana and I, and behind us are our friends Adam and Stacy. Peace. We arrived super early, which I love. 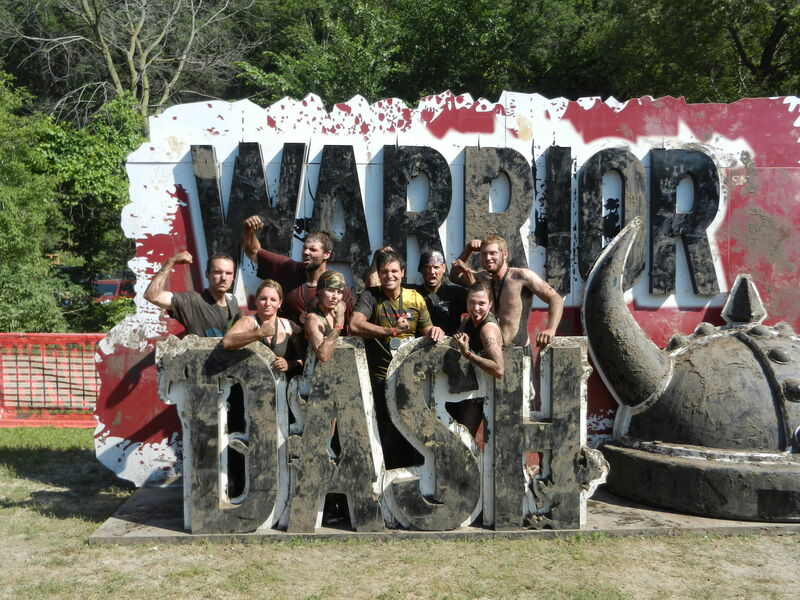 We went and picked up our bib numbers, timing chips, t-shirts, and warrior headgear. We then had plenty of time to relax, pin our numbers on, use the facilities a couple of times, and snap some clean pre-race photos with our group. Being that I have not been feeling my best lately, I was slightly nervous that this race wasn’t going to be a good idea. I become fatigued very easily, I feel weak, and my stamina isn’t where it could be, and mostly, I was afraid to be far from the restrooms. That’s the ugly truth. Not only that, I felt very sick the night before. I woke up Saturday morning feeling pretty good though, and mornings are usually better for me than night-time when there isn’t a whole lot of food being digested yet, so I decided to give it a go. Balance beam that slanted up down up down. Climbing wall with uneven foot holdings and a slanted top which made it challenging to climb over. Hurdles and barbed wire so you had to go over a hurdle and then under a barbed wire, over a hurdle, under barbed wire, etc. 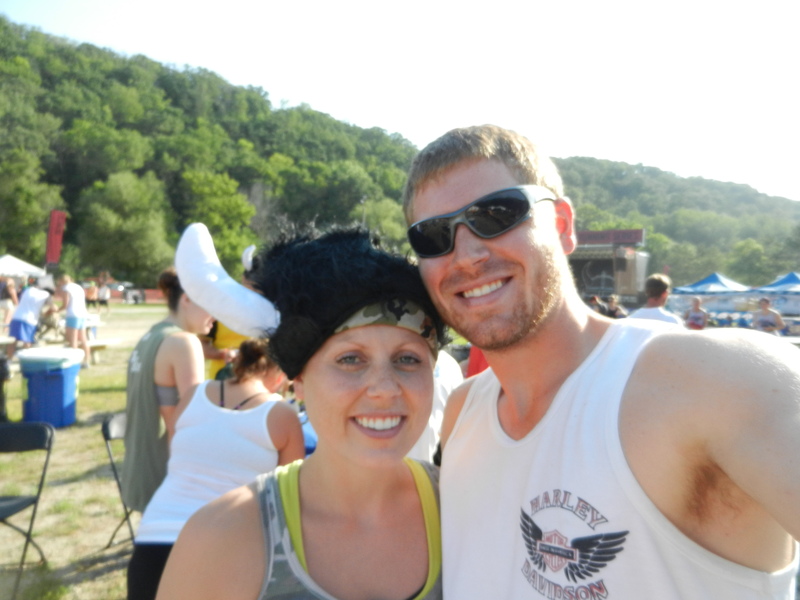 But the most challenging part of the race wasn’t the obstacles, it was BY FAR the insane amount of hills. In between the obstacles was 3 miles of “running” through the grassy, truly beautiful views of Afton Alps, but I would say (and I don’t think I’m exaggerating) that 60% of the running part was uphill. And I don’t mean little bunny hills, I mean crazy steep hills that even the most incredibly in-shape person would struggle to run up. My team walked most of the hills and even walking them was hard for me! I kept losing my breath and had one scary moment where I couldn’t catch my breath at all and felt like I was beginning to hyperventilate. This happened to me during the half marathon as well. I think what happens is when I begin to feel so short of breath, I begin to panic and the panic only makes the breathing more difficult. It is such a scary feeling though, not being able to catch your breath. The group I was with was so supportive and everyone kept cheering each other the entire way. 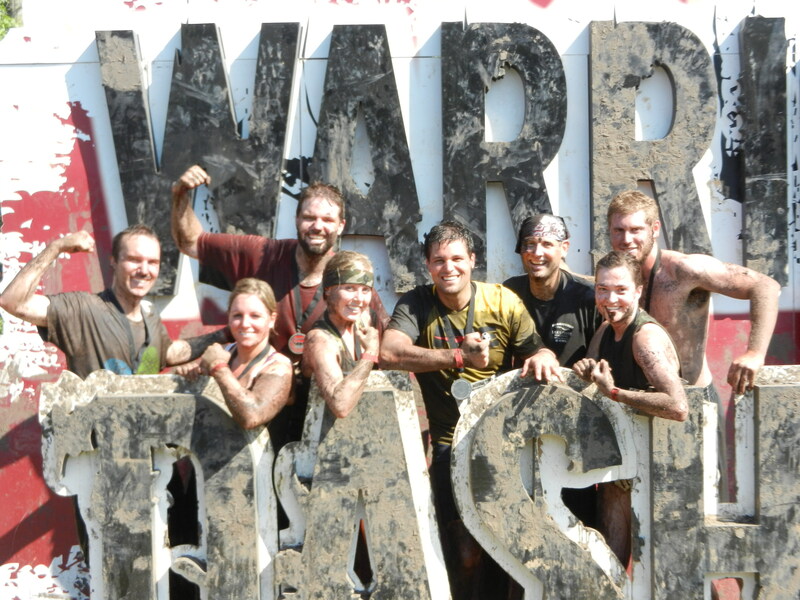 The race ends with the mud pit where you have to crawl on your elbows in 1-2 feet of wet mud under a barbed wire. 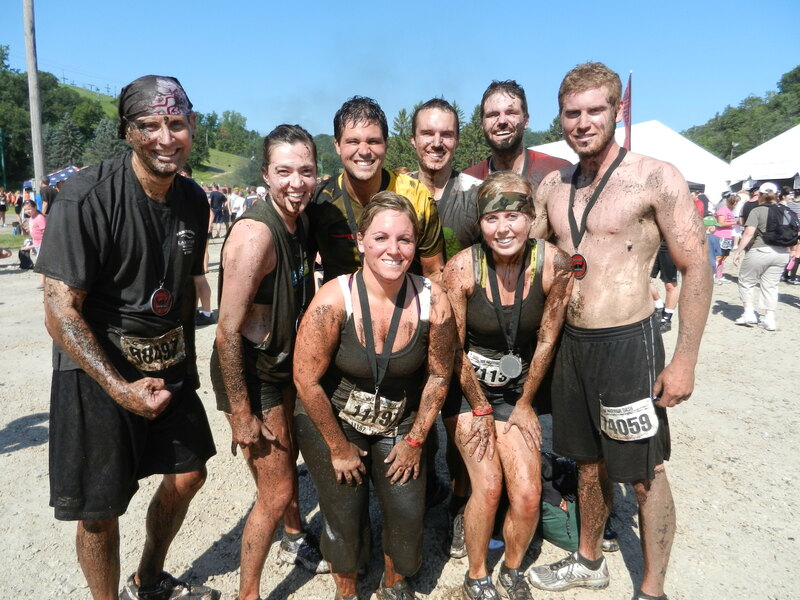 This year they sprayed us with a hose while we crawled, which made it even more messy (but so fun!). 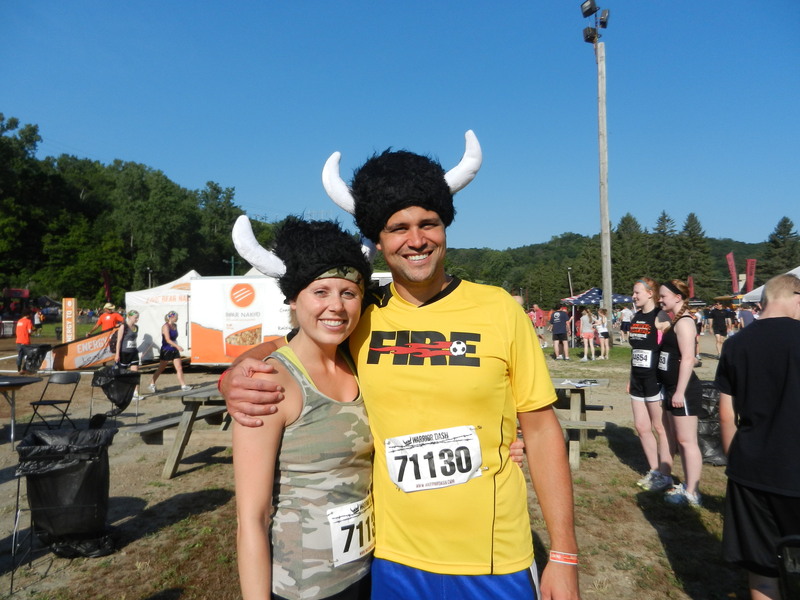 Dana and I were very cliché thanks to me, and held muddy hands through the finish line. We all finished in one piece. Kevin completely tore it up and finished probably 25 minutes before we did. Next year I tell ya, he is taking the prize. Seriously. (BTW the guy on the left in this photo is Stu, and he is Matt and Adam’s uncle and a friend of ours as well. He wasn’t in the previous photos). After all the muddy shots, we headed to the rinse area where they had a snow-making machine shooting out a thick mist of water. It was very cold but felt good to get all the muck and dirt off! We then donated our shoes, dried off in the sun, and headed home. I don’t know if I’m a true warrior. I’m more of a pansy, but I still finished the race. 🙂 Intestinally speaking, I was fine during the race, but I could tell my stamina wasn’t where it used to be. My body is fighting hard right now and I understand that, so just completing the race at all was a big accomplishment for me. Dana, Kev, and I had a wedding reception to get to. We showered up, making sure to clean out the mud in the ears, and headed to my cousin Mike and Jess’ wedding reception. They got married in Mexico in March and are having their reception back home to celebrate with everyone. It was set up in a large outdoor shelter near a public lake. It was so nice to be outside; it was a little hot, but I kind of liked it. They had the reception catered with the great classic barbecue foods: burgers, brats, chicken, beans, watermelon, pasta salads, and lettuce salad. I didn’t snap a photo of my lunch but I had a few bites of chicken, a half a burger, and a huge lettuce salad with mustard. Mike and Jess did a wonderful job planning for the reception. Thanks for a great time! At this point in time, I was completely beat, but Dana and I had a few errands we needed to run. It started with what was going to be a quick trip to our nearby natural food store, but we ended up having to make a trip to Whole Foods, and Trader Joe’s in search of almond flour among other very particular items. If you’re looking for almond meal/flour, Trader Joe’s has the BEST deal. The other stores had the almond flour as well but it was about double the cost. 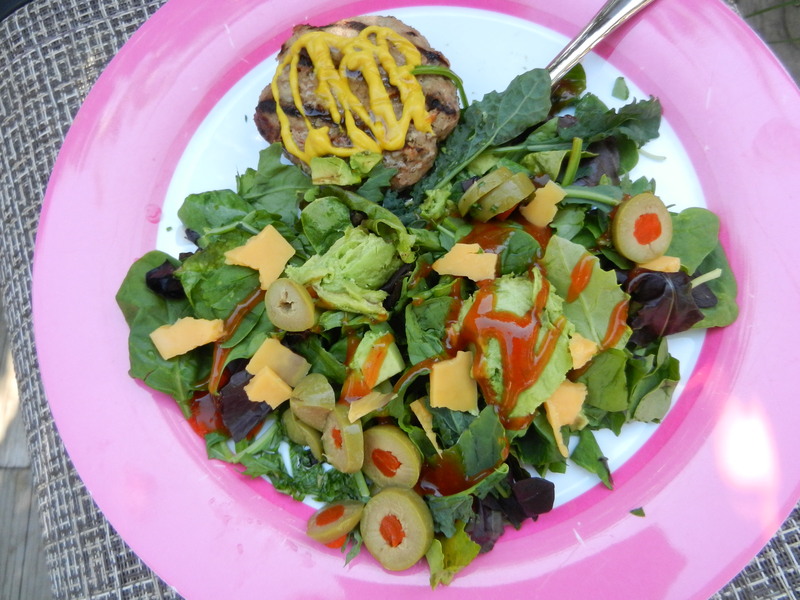 For dinner, I ate 1 1/2 leftover turkey burgers from Friday night with a side salad. I think the burgers tasted even better the second time around! The rest of the evening was spent with some food preparation. Tomorrow’s post is going to be a big one. I am beginning a new way of eating, I don’t like the word diet so I am going to try and not call it that. It is going to heal my colitis, I know it is. I have already begun to feel better and I have only just started the process. I can’t wait to break it down for you, so check back tomorrow! I don’t mean to leave you high and dry, but there is a lot that goes into it, and I want to make sure I have adequate time to tell you everything I need to tell you. I have tomorrow off of work so it will be the perfect opportunity. Alright, off to hopefully cut some awesome coupons. Have a great Sunday! This entry was posted in Breakfast, Dinners, Family, Friends, Health, Workouts and tagged Bananas, peanut butter, Protein, Races by Melanie. Bookmark the permalink.